Last week we registered Teddy for Kindergarten and new adventures await him this September when he will join other pre-schoolers to learn writing, reading, math, science, technology and other essential subjects. While we definitely rely on our educational system which is, no doubt, teaching the best our kids, we are always looking for creative and interesting ways to explore this world for our boy, to make sure his learning process is not a boring routine but rather exciting adventure. When I was introduced to Startwrite I did not expect what a powerful tool it turned out to be! 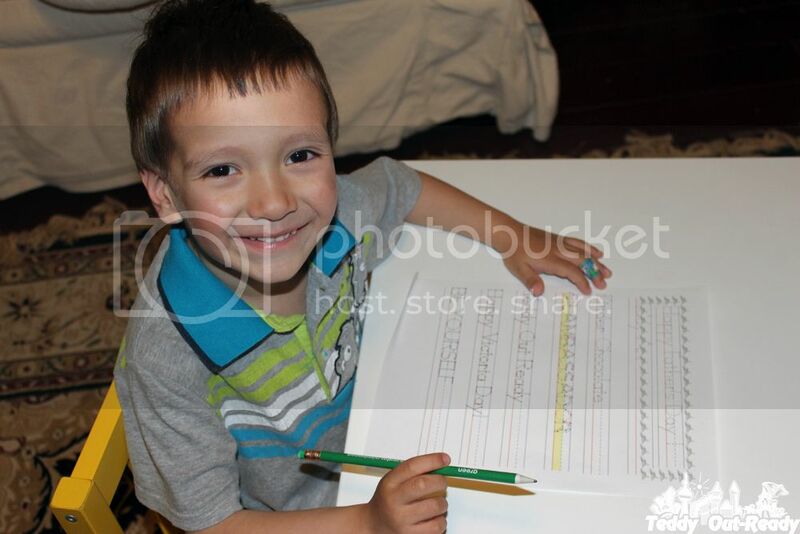 Startwrite is a software program which allows creating customized handwriting practice sheets for everyone who starts learning writing, in my case it is an amazing application for my preschooler. 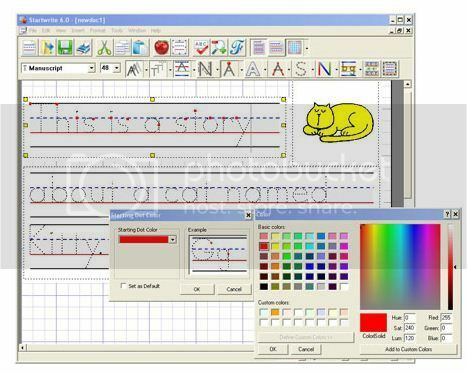 I type letters, text, phrases and congratulatory messages, for example, for my little one to practice writing. Then I print it and give it to my boy to practice. The selection of Startwrite features is really impressive, you can choose from letter outline to dotted shapes, arrowed text showing the direction of each line or curve and start dot (presented as red dot where to begin to write the letter). I like that you can choose from three types of lines: dotes, dashed or solid. Area highlight allows highlighting only one or all three writing areas – bottom, middle and top, which is great for our little one to have proper symmetric sense. There are also a good choice of border art to make a writing sheet pretty and fun, you can choose from little animals to jets, shapes, fruits and more, plus you can add any graphic files to the writing sheet. We are excited to customize and add graphics related to the text written on a handwriting sheet to involve our kid into the process. We haven’t tried Dotted Shapes yet but looking forward to it. Nice to see that the software gives an option to learn writing in Spanish and we are looking forward to new languages to be added to Startwrite features especially French writing which my boy is going to learn. You can find Startwrite visiting their web site plus the company generously offered one lucky Teddy Out Ready to win their own copy of handwriting software. Take your chance, fill the Rafflecopter form below and Good Luck! The giveaway is open Worldwide and ends May 22, 2014. One winner will receive a code to download Startwrite software. I like that there is a letter outline option, as well as a start dot for each letter. This is awsome! I can't wait to share this with my daughter for my grandson. This is old school teaching that I feel they don't do anymore. 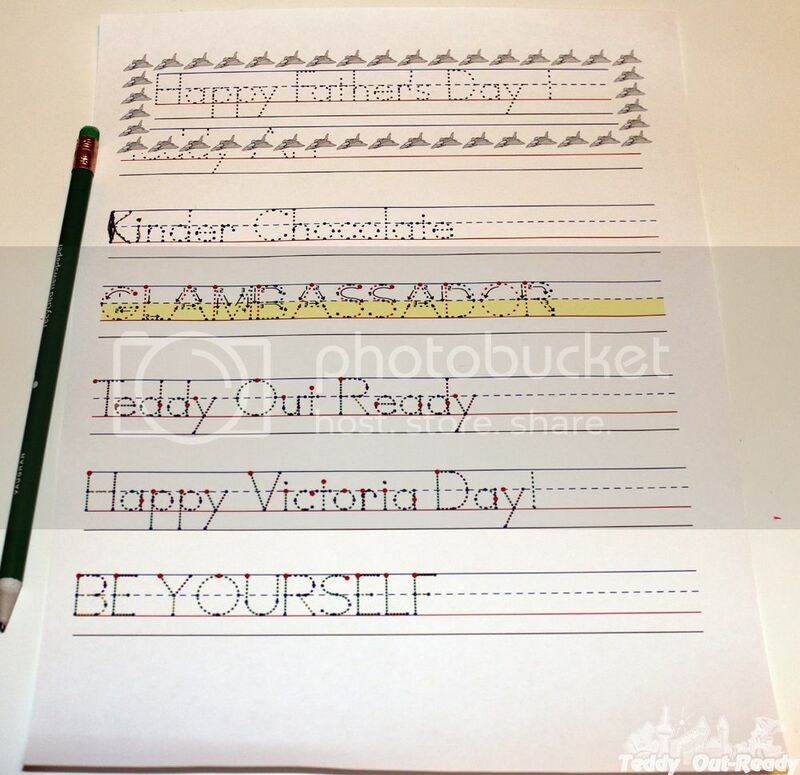 I like that you can get creative with the worksheets. I like that it offers both tracing dotted lines and letter outline. That makes the program versatile for both my pre-schooler and older children. I also like that it has such a big spell-check dictionary. This looks awesome, my son has had more difficulties than we expected with writing. He's in pre- K now but I can see him getting frustrated , but has made HUGE improvements through out the year !! I like the Decision Dots. My first grader still struggles a bit when it comes to certain letter formation (often using upper case fonts instead of lower case).